The United Nations issued a warning this week about a warming world. The organization’s Intergovernmental Panel on Climate Change released an alarming report predicting catastrophic consequences from global warming could come as early as 2040 if the world doesn’t change its ways. The frightening forecast includes frequent food shortages, worsening wildfires and destroyed coral reefs. That could be the new normal by 2040 – if governments don’t take action. The U.N. report recommends high carbon taxes in order to cut greenhouse gas emissions by 45 percent by 2030; increasing renewable energy sources, like wind and solar, from 20 percent to 67 percent; and a near-total phaseout of coal use by 2050. Elena Grossman is program manager of BRACE – Building Resilience Against Climate Effects. Located at the University of Illinois at Chicago School of Public Health, the initiative, funded by the Centers for Disease Control and Prevention, aims to prepare Illinois’ public health system for the effects of climate change. Tomas Hook is a professor of aquatic ecology at Purdue University and member of Purdue’s Climate Change Research Center. He is also director of the Indiana-Illinois Sea Grant, which is co-managed by Purdue University and the University of Illinois and conducts research and educates the public about Lake Michigan. Below, Grossman and Hook weigh in on what climate change could mean for the Midwest. Tell us about your recent report on how climate change is impacting Lake Michigan and inland lakes. 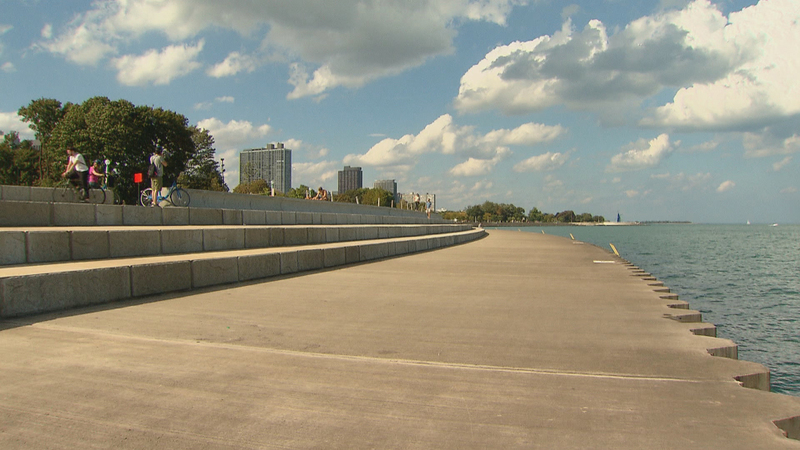 Tomas Hook: We could expect more incidents of higher bacteria levels in Lake Michigan. This could result in contaminated drinking water and more frequent closing of beaches. We’re also seeing a change in fish populations in Lake Michigan and inland lakes. Illinois/Indiana share the far southern waters of Lake Michigan, which are fairly shallow. Lake Michigan temperatures have increased 1 degree per decade since 1980. They’re likely to continue warming. That could mean cold-water fish like salmon and trout might spend less time in the shallow warmer waters of southern Lake Michigan. But warmer water could benefit other species like large and small mouth bass. These are fish that can tolerate warmer temperatures. While Lake Michigan fishermen may not have noticed much of a change yet, on inland lakes the changes have already begun. One big change certain fishermen may have noticed is that the amount of ice cover has declined. Lakes in the Midwest now freeze later in the year and the ice breaks earlier. Ice fishing has already had a dramatic decrease in the length of the season in Midwest, and that’s likely to continue. We’re also already seeing changes in certain fish species like cisco. Cisco are a species that really like cold temperatures. They’re found in inland glacial lakes in the Midwest. In Indiana, cisco used to be found in 50 lakes. Over the last 100-120 years, we’ve lost them in all but six lakes in Indiana. In the summer, inland lakes stratify – you get warm water towards the top and cold water towards the bottom. Normally when it gets hot, cisco move to the bottom, colder water. One thing that’s happened in lakes throughout the Midwest is an increase in hypoxia, which is very low oxygen that develops in the bottom of lakes. That develops due to intensive nutrient runoff into these lakes. During the summer when you get hypoxia at the bottom of lakes, the cisco essentially get squeezed between temperatures that are too warm in the top and a lack of oxygen at the bottom. When that squeeze becomes too severe, you have massive die-off and they become extinct from those lakes. With climate change this will become more severe, because the top waters will become even warmer. In the bottom of the lakes, more intense rains due to climate change, will bring even more nutrient runoff in the spring, depleting more of the oxygen. What do you say to people who think we have nothing to worry about in the Midwest when it comes to climate change? Elena Grossman: In some ways they’re not terribly wrong. The Midwest is not as affected as the coastal states within the U.S. But there are definitely changes that we’ve seen, especially with extreme precipitation. There is an incredibly large increase in the storms we’re getting where more than two inches of rain fall at a time. Besides the flooding, it has an impact on vector borne diseases. We’re seeing more cases of lyme disease. Lyme increase is connected to globalization, but it’s also connected to higher temperatures, longer summers, spring starting earlier, fall ending later. So you have this longer period for vectors to bite and they’re not dying off as much in the winter, so the population is higher. Increased respiratory problems is another public health concern. Higher temperatures combined with fossil fuels causes more ozone pollution, which exacerbates any respiratory condition. Asthma is already on the rise without the exacerbation of climate change. It also affects allergy season. We’re seeing in places like southern Wisconsin, the ragweed/pollen season is 15 days longer than it was 15 years ago. And that’s because the growing season is longer due to higher temperatures and precipitation is allowing pollen-producing plants to flourish. Any other examples of how climate change might be impacting Illinois already or how we can expect it to if higher temperature trends continue? Grossman: One health effect we haven’t discussed yet is the impact extreme weather has on mental health. After Hurricane Katrina they created a new diagnosis called Katrina Brain, which affected cognitive ability. It’s what happens when you go through a traumatic event like a flood or heat wave. Your thoughts on the U.N.’s Climate Report? Grossman: Overall, everything in the U.N. report was already well known by climate scientists. What stood out was the U.N.’s sense of urgency, their warning that we actually have less time than we thought we did in preparing for and slowing down climate change. The U.N. sounded the alarm that we need to take this seriously and we needed to do it yesterday.